Why rush the F-35 into production? The F-35. Its cost and value as a fighter plane are both questioned. Ask Defense Secretary Gates: What is the threat that justifies spending $298.8 billion on 2,456 F-35s, or $122 million each, counting research and development costs? An internal Navy briefing obtained by CongressDaily suggests, without saying it right out, that the F-35 Joint Strike Fighter ballyhooed by Defense Secretary Gates will cost so much to buy and fly that the service might have to find a cheaper plane to fill up its carrier decks. For those of us who watched the reputation of Defense Secretary Robert McNamara as a manager nose dive in the 1960s when he could not produce a carrier plane the Navy would accept, these newly expressed Navy doubts about the F-35 have a familiar ring that challenges Gates. 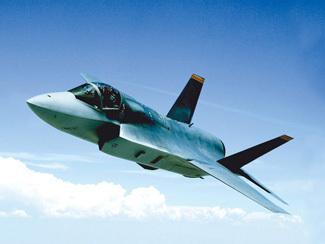 McNamara’s supposedly super-duper plane that he wanted the Air Force, Navy and, for a bit, the Marines to buy and fly was first called the TFX, for Tactical Fighter Experimental, and later the F-111. The F-35, the Pentagon’s biggest aircraft program, is supposed to be flown by the same three services. But F-35 critics contend its cost — pegged at $122 million a plane in the Pentagon’s latest Selected Acquisition Report — is out of control and its worth as a fighter is questionable. The Naval Air Systems Command conducted a hush-hush briefing earlier this month on the cost of buying and flying the F-35. One of the dizzying briefing charts obtained by CongressDaily and shown to Navy leaders states that it will cost almost twice as much to fly the F-35 for an hour as it does the existing F/A-18A through D models and AV-8. The comparative per flying hour costs are $30,700 for the F-35 of the future and $18,900 for the other two. Aviation experts suspect Navy leaders felt using the new F/A-18 E and F flying hour costs would have reduced the shock value of the comparison. “JSF will have a significant impact on Naval aviation affordability in the FYDP [future year defense plan] and beyond,” another chart warns. That’s the bureaucratic way for the Navy to warn Gates and other decision-makers that the F-35 will cost so much to buy and fly that there won’t be enough money in future Navy budgets to procure enough of the planes to fill up the holes on carrier decks, according to veteran aerospace translators. Gates so far has been dismissive of such warnings, declaring last summer at the Lockheed plant in Fort Worth where the F-35 is being built that the United States “cannot afford not to have this airplane.” But neither he nor anyone else knows for sure what the F-35 will cost or be able to do in the sky because no complete prototypes have been fully tested. Winslow Wheeler, former cost analyst at GAO and the Senate Budget Committee and now director of the Straus Military Reform Project at the Center for Defense Information, is among those who believe the fly-before-buy approach to procurement is the only way the Pentagon will ever be able to give the taxpayer a deserved bang for his buck. Wheeler would stop production of the F-35 right now and fully test prototypes of the plane to see what they can actually do. Some congressional committee or subcommittee should care enough about the taxpayer’s buck to investigate the cost and performance problems on the F-35, as the Senate investigations subcommittee led by the late Sen. John McClellan, D-Ark., did for years in hearings on the TFX, which I covered first for Aviation Week and then for the Washington Post. Among the many questions Congress needs to ask Gates and his deputies is why rush the F-35 into production before testing it fully, and what is the threat out there to our planes already flying that justifies pushing up the federal deficit by spending $298.8 billion on 2,456 F-35s, or $122 million each counting research and development costs? Gates, before he signs any more checks for the F-35, would be well served by reading the McClellan subcommittee’s final report of Dec. 18, 1970, on how that other multiservice plane, the TFX, turned out. The Navy refused in the end to buy the TFX for its carriers. It bought the Grumman F-14 Tomcat instead. Said the Senate report: “The history of the TFX program is one of a series of management blunders, a series of poor decisions at the highest levels of the Department of Defense which compounded error upon error as the TFX program stumbled along year after year. The TFX program has been a failure. This column first appeared in National Journal’s CongressDaily. That would be all fine and beaut if it resulted in defense capabilities that served the nation(s) well. What do you call the situation when rentseekers spend billions upon billions of tax payer funds and end up producing something that doesn't work?